Is advertisement the only business model for mobile? I recently attended a conference where the main theme was how to grow the audience for mobile apps. The landscape was pretty broad from games to social apps, e-commerce and so on. There were two main themes that kept being repeated at the conference: advertisement and attribution. For those like me that aren’t familiar with attribution it’s essentially a set of tools to monitor where clicks come from. This is useful in two ways: to track which of your marketing campaigns are working and to limit fraud. A talk I really enjoyed and that was full of data points was from Chris Calderon @ Gamejam. He offered a lot of detail around user acquisition strategies and costs when developing hyper casual games. An interesting aspect of hyper casual is that as a developer you should acquire users at the lowest possible cost (true for everyone) so that your users will see the most ads. This to me sounds like a numbers game, <ads I show> – <ads to acquire user> = <profit made>. A related topic that came up more than once is the relationship with the Play Store and App Store. It’s key to have a relationship with the staff there, but even when developers have a relationship, irrespective of the app category, they have no control over their own fate. Getting featured on the opening page of the store makes any app an instant success, but get below the top 10 of your category and nobody will ever find you. As a developer you are left advertising your apps on Facebook while you hold your breath and hope to get noticed and given a shot at the opening page of an app store. It’s not an exciting perspective, especially if you are a small or even medium development company. To make the situation more complex users aren’t really keen to pay a premium. Top games on consoles cost tens of dollars and often come with monthly subscriptions, but in the mobile world apps are at most 99 cent or a few dollars. Hyper casual games are quintessential of this landscape: maximize ad revenue versus cost of (user) acquisition. So this left me with more questions than answers. In a time when more and more people are wondering how to find the right balance between meaningful ads without giving up (completely) privacy why are developers cornered with only 1 viable business model? Mobile phones seem to have opened a million opportunities, but aren’t there better ways to earn a decent profit from creating apps (utility, games or other) that is not showing as many ads as possible? When you think open-source you think free. It turns out that while many still think that open-source happens mostly during the night and created by bored developers looking for fame, there is also money in it. There are quite a few companies now trying to have a healthy open-source environment and at the same time make money. I’m excited to refer to Roberto Galoppini (pure Italian) has earnt great respect in the open-source world and is now joining InitMarketing to help them. 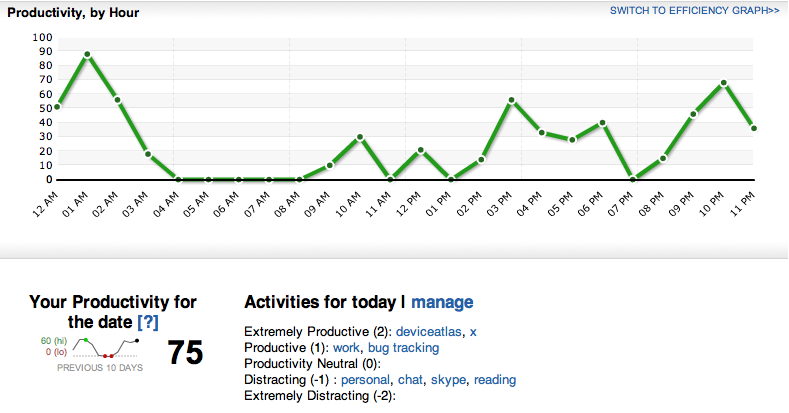 I’ve been using rescuetime for about three weeks now. Most of the applications I use regularly are tagged and marked as productive when appropriate. 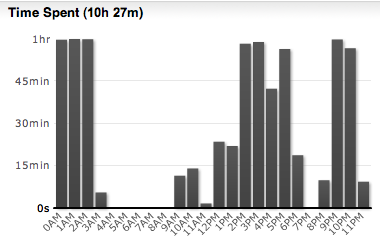 Looking at the graph for today (midnight to midnight), it’s clear that I work much more when the sun is down. Notice that the screenshot was taken around 23:20 so the eleventh hour is still not complete and that’s why the time spent is not up to the hour. 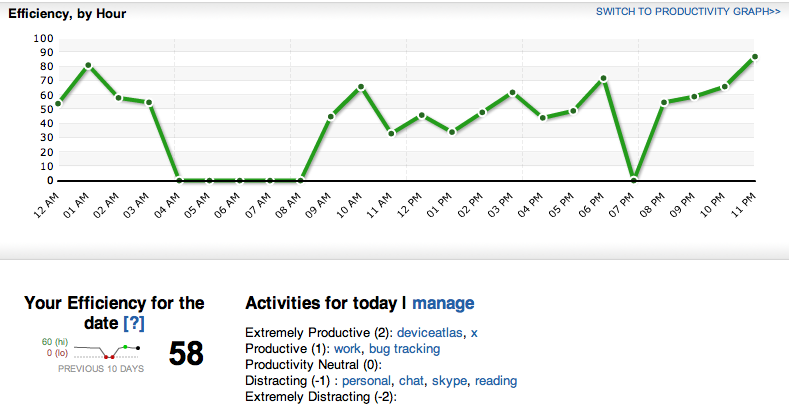 It seems like “Productivity” and “Efficiency” follow proportionally, although it seems I’m a bit more productive during the night (not while writing blog posts, of course). I wonder if I should sleep during the day and work during the night. Would I get more things done? Last week I received an e-mail from Michael of Mocondi that forwarded me an update about the status of their service. I can’t say I have known Michael for a long time, in fact I have never met him, but since the news is about mobile, it got me thinking. The information is about their product called MeYou that, from what I understood, is a program in which you can buy mobile content and services and you can suggest the same contents to your friends in your network. When you suggest something or perform other actions you earn points. This is nothing new, of course. According to their numbers, their service is very successful especially in Italy (not a surprise, again, as Italians buy a lot of ringtones and contents in general). What really got me thinking, was actually how they created the service. Reading from the website the service is available in Italy only to customers of 3 and Vodafone (I’m a TIM customer), users should download a Java application to get started. Users can browse a selection of contents available for their device and then can purchase. Billing happens via the operator. The numbers that Mocondi reports are good, such as 1.6M recommendations sent and 24% subsequent purchases. What I just don’t understand is why you need the hassle of a Java application. It’s hard to download and sometimes will fail to install. You use it to browse and send messages to your network of friends. I suppose you will also be able to manage your network. When I think about this application, I think the browser would be the perfect fit. Browsing is just what it’s made for, for a start! Managing your network is something you could do via specific pages. Messaging… Well, you have SMS and MMS and if Mocondi already has agreements with mobile operators I do not see problems delivering messages and tracking users. Settings should already be in place so no problems installing the application or downloading the catalogs. Also, I suppose that users will not get notifications if they do not start the application while with SMS and MMS you get them in any case and the browser can be started automatically (read wappush). I really think that mobile devices are the perfect target for viral marketing and I like the idea. I just think that the browser would have been a better choice. Do you read me Mocondi? Check out Refresh Mobile or Flirtomatic and how they left the Java platform for the browser. There are things that are better in Java (games, etc) and other things that are better in a browser. I know this has certainly circulated on the network a lot, but I think I need to pay my tribute to this as it’s really BIG, I think. When you wake up in the morning and the first thing you think about is that the last lines of code you wrote were not correct and you already know how to fix them. A very good press release, as always, from M:Metrics. This month it’s focused around the iPhone and how Americans and British have perceived the phone, features and how they are considering to buy it and maybe switch to AT&T. Read the full article here, M:Metrics: high awareness, strong demand for iPhone among British and American mobile phone users.